Bet You Thought I Forgot. Back in April I had a mini-contest for the five strangest places you've ever knitted, with a deadline for submissions of May 12. Prize for the strangest places was to be a skein of Gomer Pyle ("surprise, surprise, surprise") yarn. But here it is, June 25. I didn't forget to announce the winner, of course. I just hadn't gotten around to organizing stash yet. Everyone's submissions were good, so I drew a name at random. Method: write each name on a slip of paper, fold it, drop all folded slips on floor, then pick up the first one batted in my direction by a cat. Not one but two skeins (you really can't make anything with just one skein, now, can you?) 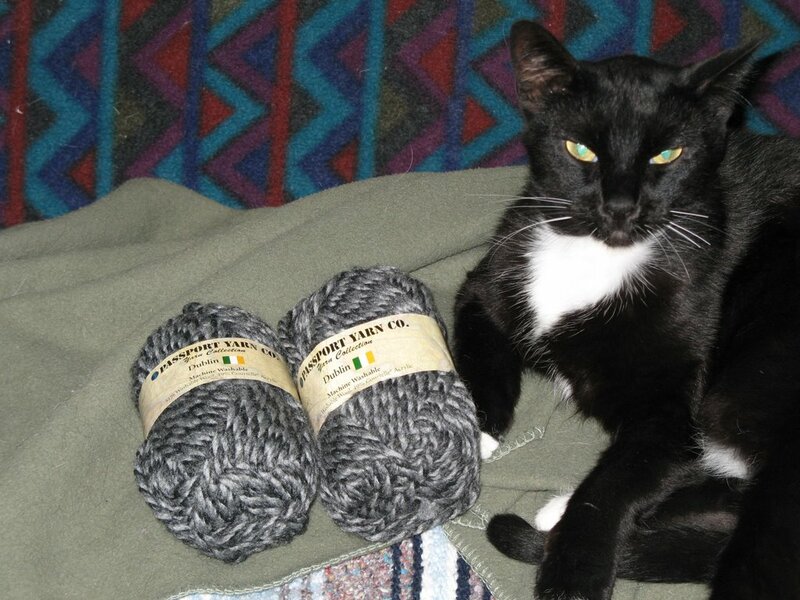 of Passport Yarn "Dublin", a machine washable blend of 51% washable wool and 49% Courtelle acrylic. This yarn is a chunky weight with a very nice feel -- I'm using it to make an Einstein coat for Mom for this Christmas -- and I hope you enjoy it, Lornajay. Passport is made for Michael's craft stores in the United States and to my knowledge it has been discontinued. To visit Lornajay's list (and everyone else's) of strangest places ever knitted in, please visit my April 27 post in the Archives. On to other strange places. 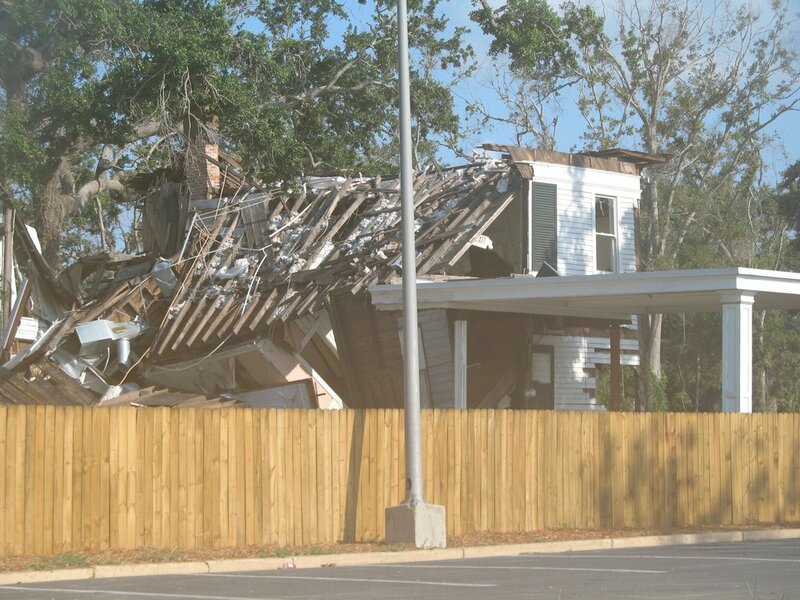 I returned from my seminar in Gulfport., Mississippi, a little bit east of where Katrina made landfall. 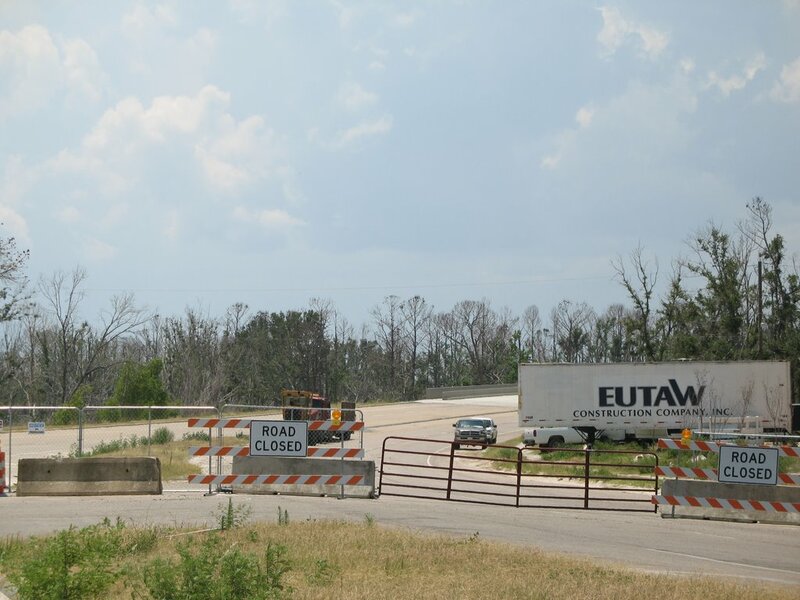 Ten months after Katrina, a large portion of the shore road, Highway 90, remains closed in the area of landfall, around Waveland and Bay St. Louis, Mississippi, near the Louisiana border. Actually, closing the highway in that area was not really necessary. The coastal highway is gone. In eastern coastal Mississippi, where Highway 90 isn't gone ... just about everything else is. Can you guess what the vertical white things are, in the midground of the next picture? And what's that stuff in the grass, in the foreground? To enlarge the picture, click on the picture, then click on the lower right-hand corner. The white things are pilings (foundations) of several houses which sat high up off the ground in hopes of avoiding the storm surge. The houses are now gone. The trees you see are mostly very tall pines which have been stripped of most of their branches. The green, weedy places in the foreground are lots where other houses with concrete-slab foundations stood, less than a year ago. And the stuff in the grass? That's the beach. 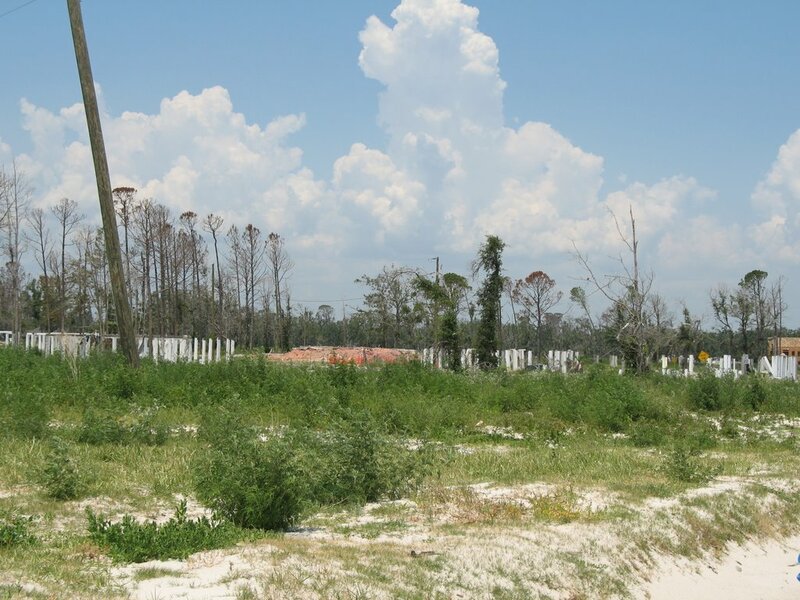 Katrina decided to move the beach a quarter-mile inland. This was once a fairly dense coastal neighborhood, full of houses and businesses. And now? This is where it's "not so bad" in Mississippi. Gulfport is pretty much gone within 1200 feet of the beach, and badly damaged inland, but non-beachfront Gulfport is still mostly recognizable as a town, and is trying to recover. The entire town of Waveland -- back where the highway is gone -- has simply been scoured off the face of the earth. Whoopee! What a lovely way to start the week.